This book is about a remarkable family business that operated in Rathmines, Dublin, for nearly a century. As makers of some of the largest and best-known telescopes of the Victorian era, the Grubbs were at the forefront of optical and mechanical engineering. Actually, I wanted to call it Grubb Dublin, the name that appeared on their instruments, but the publisher decided otherwise. For 95 years Thomas and Howard Grubb, father and son, supplied astronomical instruments to the world. The book contains extensive quotations from their original letters and papers, allowing them to speak for themselves. Their story is one of the development of a small firm of surprising technological sophistication from its beginnings in 1830 as a metal billiard-table manufacturer to its eventual position as one of the major telescope makers of the Victorian era. The cover (right) shows the Great Melbourne Telescope, as erected in Grubb's yard in Rathmines, Dublin, in 1868, shortly before it was shipped to Melbourne. 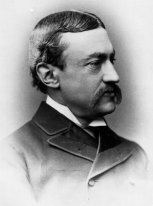 The founder of the firm, Thomas Grubb, was an innovator in the field of telescope making and optical design. One of his earliest instruments - the Markree telescope in the West of Ireland - was, for several years, the largest telescope in the world. He was also responsible for the construction of the Great Melbourne Telescope , the largest equatorially mounted instrument for several decades, dwarfed only by the 3rd Earl of Rosse's crudely mounted "Leviathan of Parsonstown". The Melbourne telescope, after extensive reconstruction, was used for the "MACHO" gravitational lensing project. It was destroyed in the Mount Stromlo fire of 2003. Shown on right is a public observatory he operated at his factory near Charlemont Bridge, Dublin. Howard Grubb (left) formalized the business, built a new factory (right) and capitalized on the rapid growth of astrophotography and astrophysics. He obtained the contract for what was briefly the world's largest refractor, the 27-inch centrepiece of the Royal and Imperial Observatory in Vienna. In the early 1900s, Howard Grubb turned to making periscopes for submarines and this was the chief occupation of the firm until the end of the 1st World War in 1918. The economic dislocation at the end of the War was too much for Grubb, by now an old man, and the company gradually slid into chaos, producing thereafter only a few telescopes. In 1925 the Grubb company was rescued from bankrupcy by Sir Charles Parsons and reconstituted in Newcastle upon Tyne as Grubb Parsons. It survived until 1985. Not a KKK meeting, but Casting the speculum metal mirror of the Great Melbourne Telescope (1866). The metal was heated at the right and carried in the red-hot pot to the tilting apparatus (centre foreground). 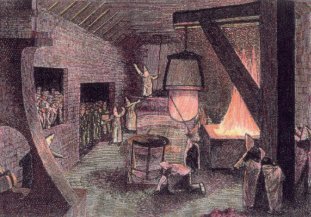 It was poured into the circular mould, which was then placed into the annealing furnace at the back of the room. 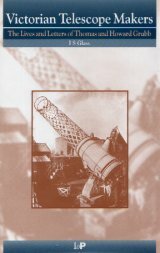 List of Grubb telescopes etc.